Pearcey, Nancy. 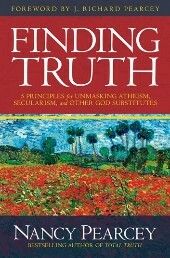 Finding Truth: 5 Principles for Unmasking Atheism, Secularism, and Other God Substitutes (Colorado Springs: David C. Cook, 2015), 320pp. According to the Scriptures, there are no true atheists. There are those who say “there is no God” (Ps 14:1), but by the testimony of that which has been created all men know that there is a Creator to whom they are morally accountable. Thus instead of repenting and turning to the one true God, men fashion idols for themselves from that which has been created. In the case of atheism, man deifies matter, energy, the laws of nature, and the like, predicating of them the attributes of omnipotence, omnipresence, eternality, and omniscience. Throughout church history, Christian philosophers and theologians have made this point in their writings. As of the last century, in fact, this point has been driven home repeatedly by presuppositonalist apologists following Gordon H. Clark and Cornelius Van Til. These works are excellent, but some have not always done so in a manner that equally appeals to the scholar and the schoolboy alike. This is where Nancy Pearcey’s Finding Truth: 5 Principles for Unmasking Atheism, Secularism, and Other God Substitutes excels. Pearcey’s book cogently argues the case from Romans 1 that what are often regarded as non-theistic beliefs to which unbelievers just happen to subscribe are in actuality forms of idolatry. Either one trusts the One True God, or one trusts some part of his creation. There is no third alternative. Pearcey convincingly argues that the reductionism of idolatry, wherein all reality is reduced to one aspect of reality (e.g. matter, mind, power, energy, etc), forces idolaters to mark that which cannot be covered by their worldview as unreal. And this is the collapse of these worldviews, for in identifying a real aspect of the created order as being unreal these systems tacitly admit they are failures. These worldviews, moreover, result in self-contradiction, being unable to account for their foundational axiom/s (e.g. “All things are material” does not account for itself, an immaterial assertion). Pearcey is philosophically astute, giving her readers a good overall picture of philosophy’s more pivotal persons, places, and theories. Finding Truth’s presentation of these thinkers and their ideas — whether Kant and his Copernican revolution in metaphysics and epistemology, Nietszsche and his Will to Power, or the Postmodernists and their reductio ad civitas — is not overly technical or insufficiently detailed, but tailored to suit the need at hand, viz. Giving a reason for the hope that lies within us. This is done by dissecting all other worldviews with the five principles Pearcey lays out, but can also be assisted through the use of the study guide she provides at the end of Finding Truth. This book can be used in a wide variety of contexts — e.g. college course, bible study, apologetics training courses, individual personal study, or as part of a high school curriculum — and make it a wonderful contribution not only to apologetics in the abstract, but on the tangible level of preaching, teaching, witnessing, and living our lives in the world.